For almost two decades, safe, effective flea medications from your veterinarian have helped pet owners battle these blood-sucking parasites. Now, several "generic" flea medications are flooding the market, showing up in big box stores and grocery stores across the country. 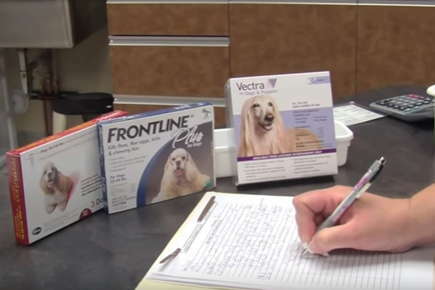 Will these cheaper medications help more pets or do they have the potential for failure? For a long time, flea control consisted of harsh products that were related to nerve gases of World War I. Many of these carbamates and organophosphates worked well at killing fleas, but unfortunately, they weren't very safe for pets and had the potential for severe toxicity. Then, about fifteen years ago, modern chemistry helped give us safer topical flea treatments. Because fleas, ticks and other parasites are medical problems that need educated medical recommendations, the companies producing the new products chose to sell these flea medications only through veterinarians. Fast forward to present day and you can find many flea products both over the counter (OTC) and through veterinary or "ethical" channels. Annual sales of flea and tick medications exceed $1 billion and there are many companies eager to get their share of the pie. Recently, the compound, fipronil became available for generic use. The original patent holder, Merial, produces an excellent flea product (Frontline®) that was the main choice of veterinarians for many years. Now, no less than 15 "generic" fipronil flea products will be offered in the OTC markets. What does this mean for you and your pets? Can you feel comfortable with generic flea medications? First, let's look at what a generic medication is. When a specific pharmaceutical company develops and patents a new drug, they are allowed the exclusive rights to sell that drug for a period of time. When the patent expires, other companies can then market their own products that use that drug. Since the generic companies don't have any research and development costs and very little advertising is needed, their costs are much lower and, therefore, their selling price is also lower. Although generics utilize the same active ingredients as the original, they are not exactly the same product - and that is very important to know. Different inert ingredients that are generally recognized as safe may be included. In the case of flea medications, these inert ingredients are usually the carrier molecules, or what helps spread the medication across the pet's body. The FDA requires that generic manufacturers prove their product exhibits bioequivalence to the original product. In the case of topical parasiticides, many of these products are actually regulated by the EPA instead of the FDA. This means that a veterinarian's prescription is not necessary to purchase the product, although, as mentioned above, most of the original pharmaceutical companies chose to sell their product "under veterinary supervision". The generic manufacturers do not have that same belief and the new copycat flea products will be found on shelves of Wal-Mart, Target and other big box stores across the country. So, if the product is essentially the same and at a lower cost, is it ok to buy these over the counter flea preventives? Fleas, as well as other parasites, can cause a host of medical problems that go beyond simple itching. Serious diseases can worsen if the issues are not handled properly. In a general merchandise store, you will not find anyone with the expertise or training you'll find at your veterinarian's office. Not to mention someone to call should your pet have an adverse reaction to any topical treatment. Believe it or not, it might be more economical and more convenient to purchase the preventives through your veterinarian. Not only can you get all the products (flea preventive, heartworm preventive, etc) at one location, some of the ethical products sold through your veterinarian can actually help with all parasite problems. So, a single product could be the answer for your pet instead of several that end up costing more. Veterinarians will also often provide a single dose of the flea product instead of the six pack you find at the store. It's another way he or she can help you save money! It's also important to note that the federal government has actually ordered multiple manufacturers of these generic flea products to remove some products from store shelves. Your veterinarian knows that your pet is unique and may not tolerate certain products as well as others. Your veterinarian's medical advice has real value…especially since the wrong product used improperly actually has the potential to be fatal! Your veterinarian will understand if there are other possible interactions between flea preventives and other medications your pet is taking. Finally, the healthcare team at your veterinarian's office can not only show you how to properly use the products in question, but they will keep a complete record of what you have used in the past, taking the guesswork out and possible preventing future complications. And you already know they will keep track of your pet's overall health and find medical problems early while they are still inexpensive to treat. Your family veterinarian is a part of your pet's health care team.